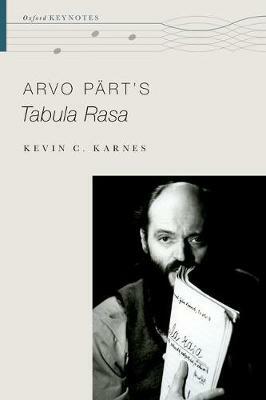 One of today's most widely acclaimed composers, Arvo Part broke into the soundscape of the Cold War West with Tabula Rasa in 1977, a work that introduced his signature tintinnabuli style to listeners throughout the world. In the first book dedicated to this pathbreaking composition, author Kevin C. Karnes tells the story of Tabula Rasa as one of Part and of Europe itself, traced over the course of a quarter-century that saw momentous transitions in European culture and politics, history and memory. Beginning at the site of the work's creation in the Estonian SSR, and drawing extensively upon a range of previously unexamined archival materials, Karnes recounts Part's discovery of tintinnabuli amidst his experiments with the music of the Western and Soviet avant-gardes. He examines Tabula Rasa in relation to modernist conceptions of musical structure, the ascetic practice of Orthodox Christianity, postwar experiences of electronic music, and the polystylistic approaches to composition that have become emblematic of the Soviet 1970s. Tracing the export of Tabula Rasa to the West and Part's emigration in 1980, the book reveals intersections of critical commentary with visions of the "end of history" that attended the collapse of European communism to suggest that it was in this confluence of listening, discovery, and geopolitical reordering that enduring lines of conversation about Part and his music took shape. Kevin C. Karnes is Professor of Music at Emory University. He is the author of A Kingdom Not of This World: Wagner, the Arts, and Utopian Visions in Fin-de-Siecle Vienna (Oxford University Press, 2013) and Music, Criticism, and the Challenge of History (Oxford University Press, 2008).